If you haven’t noticed, I love beans. That’s right, I am not ashamed to declare my love of legumes loud and clear (loudly and clearly? grammar police?) on my blog. I mean, what’s not to love? They’re good for your heart. They make you.. er… wait. No. Just kidding. They’re tasty, affordable, nutritious fiber-filled protein, okay? My legume-love must at least be evident to some readers, one of which being my mother-in-law Deb, who recently donated a portion of her bean-surplus to my pantry. 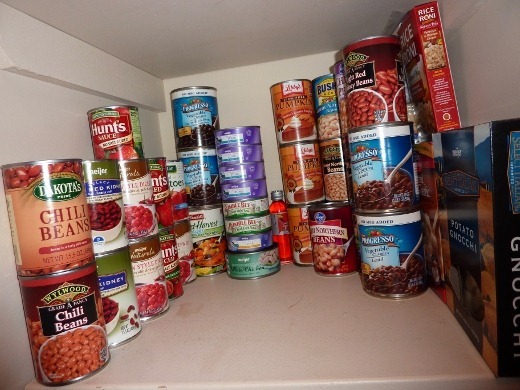 Several of these cans are things I previously purchased and had already, but in any case, I’ve immensely increased my bean supply! (And yes, there are still a few cans of lurking pumpkin back there. Muahaha!). 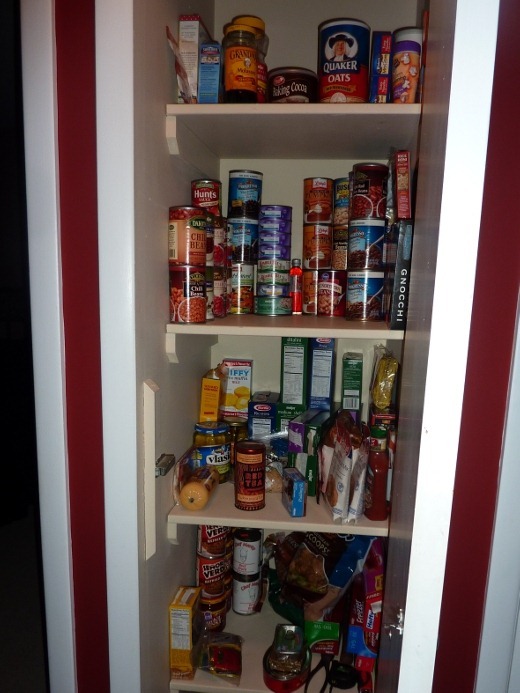 A well-stocked pantry! Borderline-ridiculous given our household of TWO. But you just wait – those beans will disappear quickly. I already have plans for four of the cans this week. Oh fo sho. 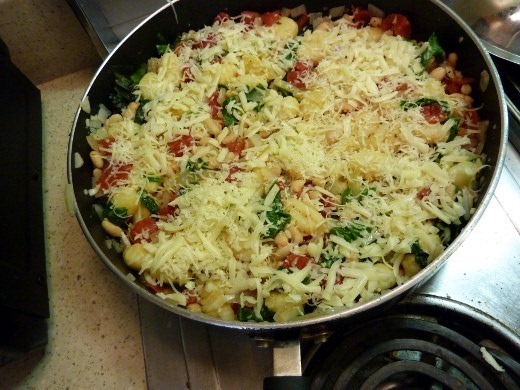 With beans on the brain, and a crisper drawer full of CSA veggies, I set out to make Skillet Gnocchi with Swiss Chard (recipe from Eating Well). Look at this pretty Swiss Chard! This was a veggie I was excited to try, from my CSA Box this week. This dish was pretty easy but I used wayyyy too much onion. And that’s saying a lot because I love me some onion. 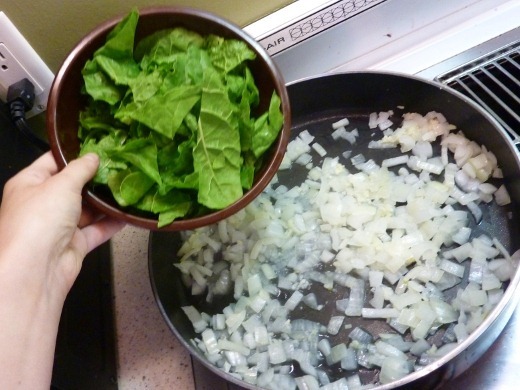 But here, you get the jist: sauté onion and garlic, add the chopped, de-stemmed Swiss Chard and cook for 1-2 minutes until wilted. Add a can of BEANS (!!!!) 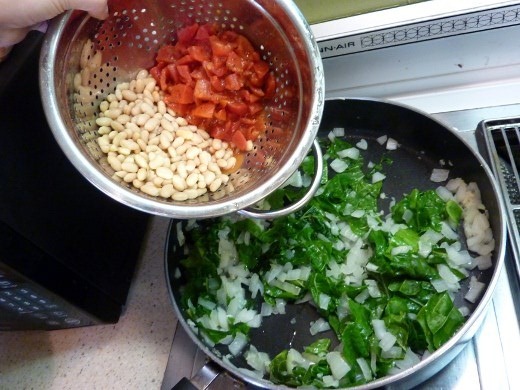 – White Northern in this case, and a can of diced tomatoes with Italian seasoning to the chard, onion, and garlic. 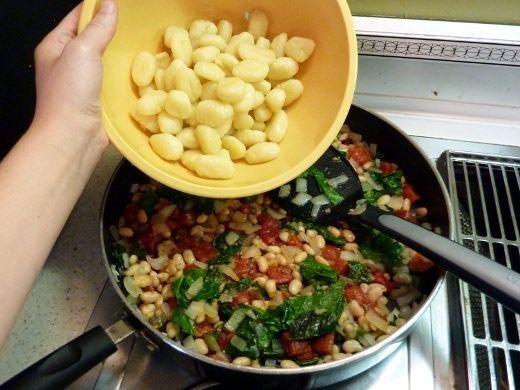 Add gnocchi, after sautéing it in EVOO for a few minutes. Cheez-it. Cheese it. Mozz and Parm. 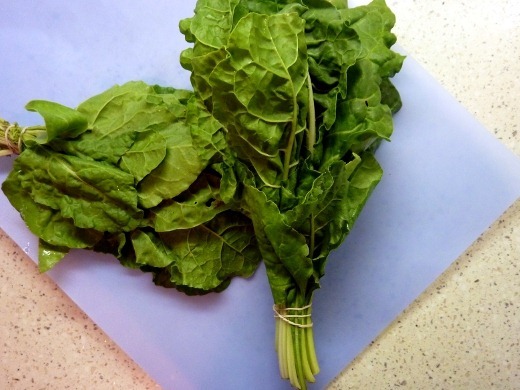 The Swiss Chard was good! Kind of like a more intensely-flavored spinach. I am a fan. So what else have I been up to? 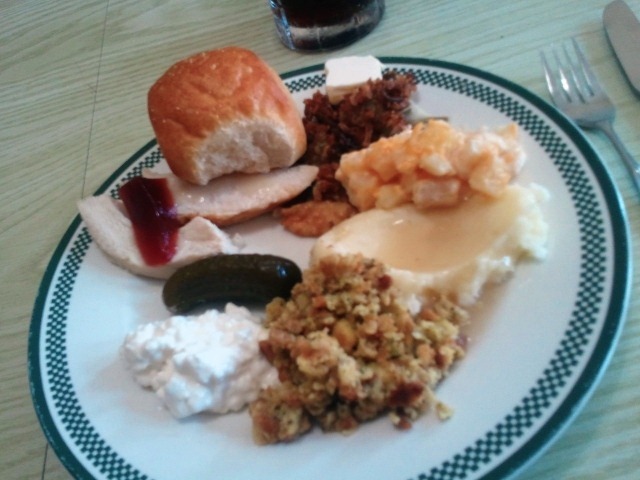 Well… a few days ago I had this tasty Thanksgiving feast. Yes, it is July, kids. (Oh, and ‘feast’ = this plate x2 + pumpkin pie x2!). I’ve also been playing with some TOYS. Guess what I bought….!!!!!???? A Garmin! The Garmin Forerunner 305. Boo-flippin-yah! 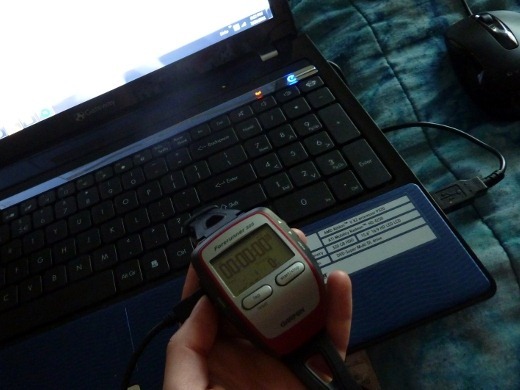 A couple months ago I promised myself that if I completed my 5K race, I would reward myself with this GPS watch, and here it is! Unfortunately it was also about 100 degrees today (literally), so a run was not in the cards. I’ve also been playing with this guy lately. I don’t want to speak too soon, but I mayyy have an upcoming audition. Will keep you posted. 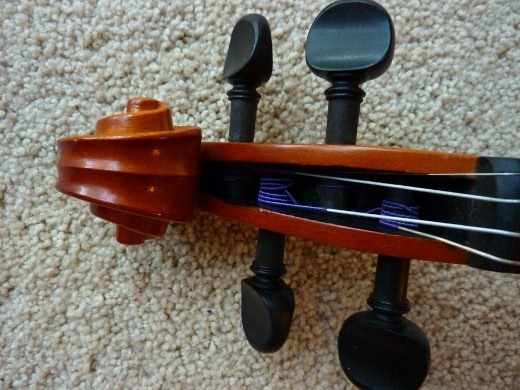 Another FUN gadget! STEAMSHARK! 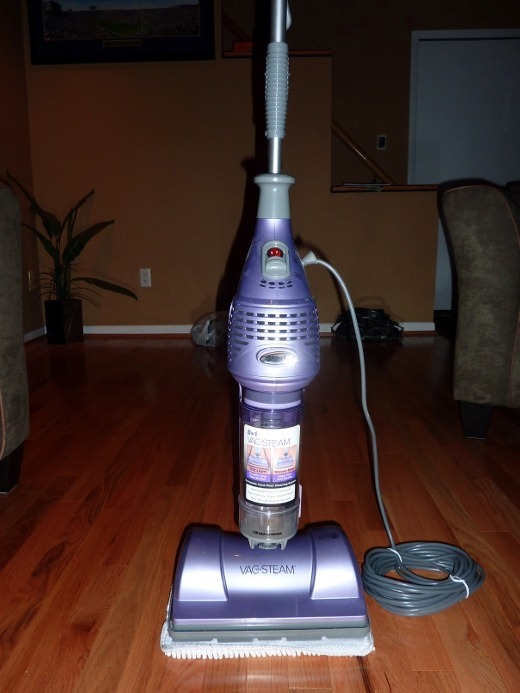 Vac then Steam! I’ve been wanting one of these for ages. I have yet to try it, but she sure is gorgeous, ain’t she?! Currently listening to: I Wanna Go – Britney Spears. Pingback: CSA Week 9 / Four-Bean Chili « Meg.Goes.Nom.Nom. Pingback: Stuffed Pepper Soup « Meg.Goes.Nom.Nom. 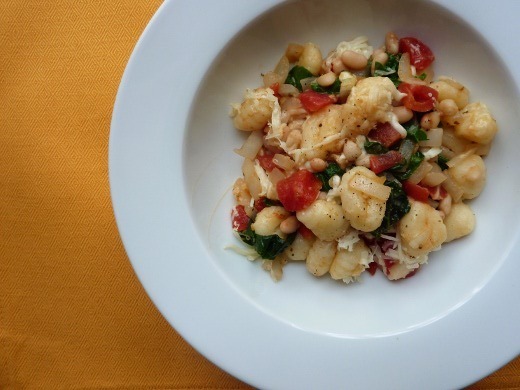 Pingback: Turkey-Sausage Gnocchi Soup « Meg.Goes.Nom.Nom.